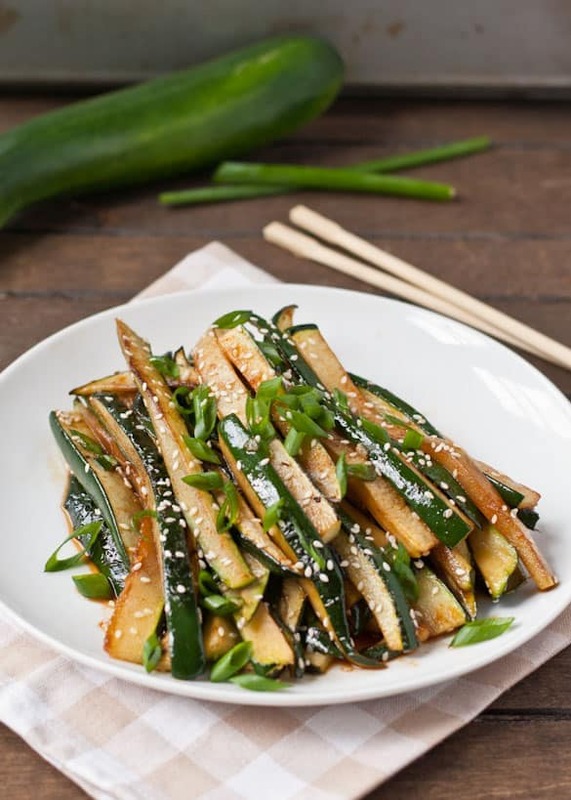 This Spicy Asian Zucchini can be whipped up in 10 minutes and makes a great summer side dish. I firmly believe there is a direct correlation between the amount of zucchini we have available to us, and how excited I am to use it. At the beginning of the season when the first small zucchinis show up in our gardens or our CSA boxes, it’s a thrill. We make our first zucchini bread, toss them into omelets, and maybe even saute them for a sandwich. But then they keep coming. They grow in both size and number, and by mid-season, when the zucchinis are taking over our gardens and our countertops, we’re sick of them. We research recipes on Pinterest for zucchini tots, zucchini brownies, and zucchini casseroles. We think if one more baseball-bat-sized zucchini dares show up at our house, we’ll just have to pack up and let the zucchinis have the place. It’s when you’re in that place of sheer desperation that this recipe comes in handy. It’s super simple (as in 5 ingredients and 10 minutes prep time), it uses at least one of those pesky zucchinis, and it’s a welcome departure from the more traditional cheesy zucchini casserole or zucchini bread. 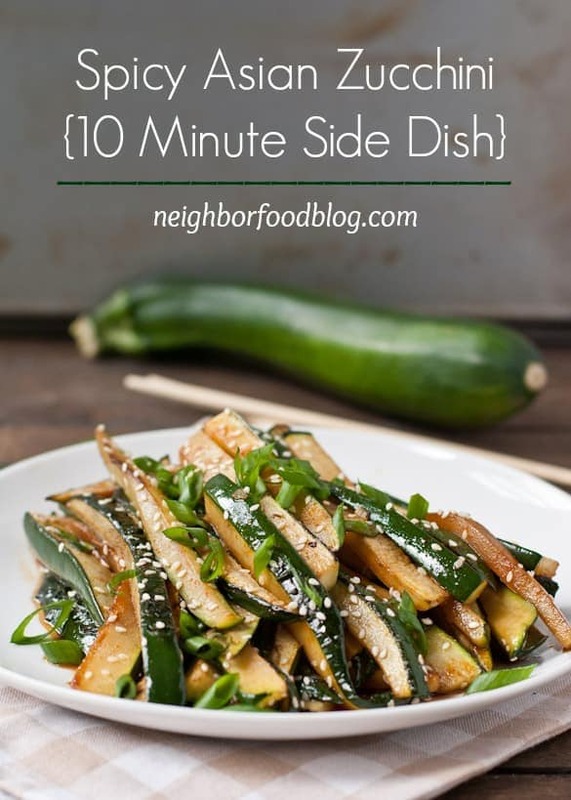 This dish gets it’s flavor from a mixture of soy sauce, sriracha, and honey which provides a good punch of spicy heat to the otherwise (dare I say) lackluster flavor of the zucchini. A little sprinkling of sesame seeds and green onion round out the deal. So don’t pack up your things just yet. Fight back the onslaught of zucchinis and enjoy a fab side dish all in one shot. Now that’s what I call killing two zucchinis with one recipe. Heat 2 teaspoons of sesame oil in a large skillet over medium high heat. Add the zucchini (you may have to saute them in batches depending on the size of your skillet and how much zucchini you have). Sprinkle with salt and pepper and saute until browned and tender. Remove from heat. Repeat with remaining zucchini if needed. Whisk together the soy sauce, sriracha, and honey. Pour the mixture over the sauteed zucchini (again, you may not need to use all the sauce depending on how much zucchini you have. Taste as you go). Toss to combine. 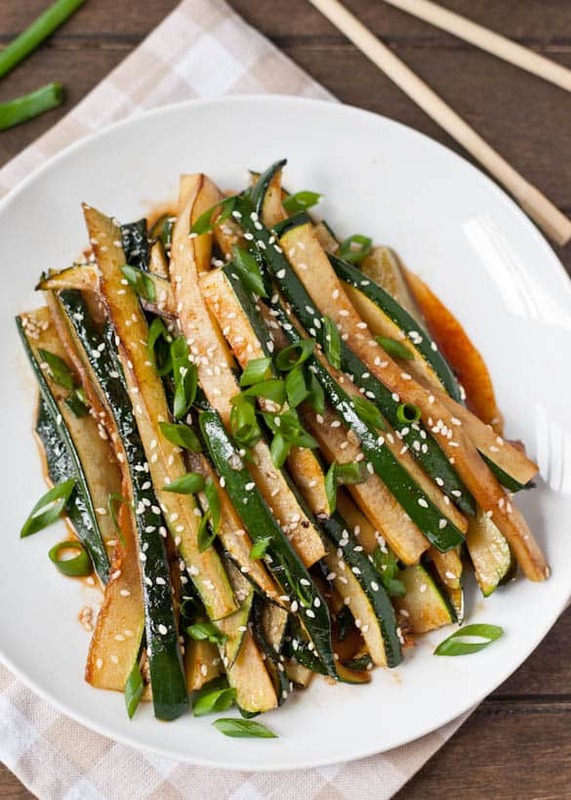 To serve, sprinkle the zucchini with sesame seeds and green onions. This side dish is tasty warm or at room temperature. This looks so good, I might never even get to the main dish. Awesome! So need this recipe! Impulse bought way too many zucchini this weekend at the farmers market, because it was so darn cheap, and I’ve been trying figure out what to do with it. You are my hero! I totally hear you on this. Zucchini is so exciting at first. And then it just keeps coming…and coming. I’ll definitely be keeping this recipe in my back pocket, because I always have all of the ingredients on hand. Beautiful photography, too. Love it! Haha! I love the zucchini desperation season, as weird as it sounds. 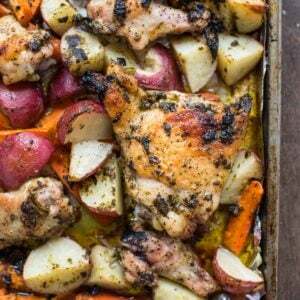 And I love the flair of this side dish, too–will need to try it tonight! I just made this. Lovely! I can’t even tell you how excited I was to find this recipe! I make two zucchini side dishes…..pretty much always Italian inspired and for YEARS. This is easier, faster, and tastier! 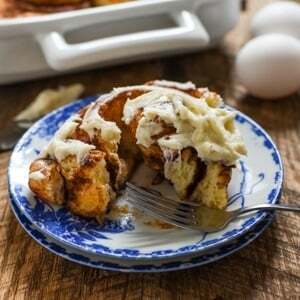 Love this recipe so much! This comment made my day! I’m so glad you enjoy the recipe! This is a keeper. I made it tonight for a change from my usual zucchini recipes. Delicious! Thank you so much for this recipe. I’m glad that you wrote that it could be eaten room temperature because, I’m cooking for my family for my 4th of July cookout. It will be a hit. I was looking for something besides the same boring potato salad, baked beans and Mac and cheese that we have at every cookout. My family loves spicy and this recipe is going to be a winner. Yes! That would be 38 calories per serving, so 1/6 of the total recipe. Hope that helps!